Spanish Crossings is an epic tale of love, politics and conflict, with the yearning but elusive possibility of redemption. A woman’s life has been cast in shadow by her connection to the Spanish Civil War. We meet Lorna in Spain, 1937 as she falls in love with Harry, a member of the International Brigade who had been at Guernica when it was bombed. Harry is then killed in the fighting and Lorna fears she might have lost her best chance of happiness. Can she fill the void created by Harry’s death by helping the child refugees of the conflict? She finds a particular connection to one boy, Pepe, and as he grows up below the radar of the authorities in England their lives become increasingly intertwined. But can Lorna rely on Pepe as he remains deeply pulled towards the homeland and family that have been placed beyond his reach? Coming through the war, then the post-war rebuilding, Lorna and Pepe’s relationship will be tested by their tragic and emotive history. Having written a string of Spanish Civil War novels, and read countless more, my enthusiasm is beginning to wane at times (having said that, I plan to write plenty more). To hold my interest, an author needs to come up with a new angle, especially when it comes to the International Brigades, who get far more books written about them than the forgotten local heroes of the war. So thank you to John Simmons, who has tried something outside the usual storyline and predictable ending. Lorna is fairly typical young woman of her time who works in London. Lorna has a lover, Harry, who volunteers to fight in Spain while his country stands idly by. Only Harry goes and gets killed at Guernica. The pain is real for Lorna, who loses someone in the worst way, killed and largely forgotten in a war his country won’t recognise. Of course, Lorna’s experience isn’t a rare one during the Spanish Civil War, but how she learns to cope is unique. Lorna works at a law firm, which is working with Spanish refugee children. Pepe has been shipped to England, as were thousands of Basque children during the war, in an attempt to keep them safe as the fascists invaded and destroyed their own country. Lorna ‘adopts’ Pepe, and how Lorna learns to live with Harry’s loss is entwined with how Pepe copes with being sent from the Basque Country and his family left to their fate. Lorna has been torn from a loved one killed in hell, and Pepe longs for his homeland, the hell which killed Harry. But Pepe is an innocent bystander in this mess, and Lorna’s friendship might just be the only way to save them both. The children of the Basque country became foreigners a country that doesn’t fully understand the complexity or the horror that is happening in Spain, and life in London in the late 1930’s is described beautifully without the usual clichés. This book allows people to feel what it would have been like for all the Lorna’s and Pepe’s of the age, and the realities of having to cope in a world sinking into fascism. There are plenty of lessons to learn that could be just as meaningful for 2018 as the 1930’s. From the ship which took 4,000 people to England (when it should have taken about 800), to pre-war London, the bombings of WWII, and beyond is shared by Lorna, the book capped by moments told by Lorna’s son at either end. Happiness is not simple or attainable for everyone, and what it means to heal and be happy again is different for every person. Lorna and Pepe are a shining glimpse to a time when life and death, reality and art, truth, lies and propaganda, love, friendship and home all meant different things. Thank you to John Simmons, for a refreshing take on a classic story. Here we are – yet another Spanish Civil War book, which alternates between present day and the 1930’s. All I can say is – yay! I’ve written three of these myself, so I’m always pleased to find another one, but this one is different to many I have stumbled across. The book starts in present time, where Alberto has just been to a funeral, of his friend, Carlos, who grew up with Alberto in rural Aragon. The remembrance of his childhood friend takes Alberto back to the time where he was known as Albi, only aged nine, and the memories he still hasn’t managed to shake. It’s September 1938, and Republican Aragon is being eaten up by Nationalist rule. Not a story about the frontline, but rather this book takes us into the lives of those who lived during the war under their new fascist rulers, and the reality that they faced in the uproar of the civil war. 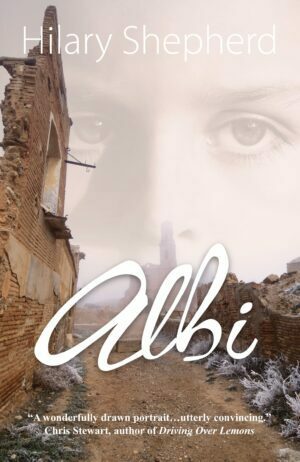 Poor Albi is only a boy, and his parents, three sisters and his senile grandmother are forced to live under the Guardia soldiers who have occupied their town. Albi’s bother Manolo was gone off with the Republican army and is already a ghost in Albi’s life. Things start hard and frightening for Alibi, adjusting to soldiers everywhere, curfews in place, and odd screaming echoing, but the adults in Albi’s life won’t share anything with him. Albi herds sheep for his disabled father, but whisperings in his house start leading to a slow demise for Albi as his family falls apart with illnesses, hushed up mysteries, secret weddings, and daring daybreak escapes. Albi and Carlos are kids caught in a real disaster destroying their country. But Albi’s life takes a dangerous turn when he starts passing messages and spending time with Mena, a woman from Valencia who stands out, and Mena is not one to sit back as war changes their country. The marquis are in the Aragonese hillside, rebel fighters prepared to take on Francoist soldiers, regardless of the cost. Albi’s trips to see Mena lead him to a moment in the war he cannot forget, not even in 2017 when Alberto’s story has caught the attention of people making a show about the war. While Carlos’ granddaughter is telling the stories she was told, Albi is the one with the real truth, the truth Carlos didn’t know or share. Death came to Albi’s village and he is the only witness who knows the truth, which haunts his dreams nearly 80 years on. But is 80 years enough for Alberto to be ready to tell the whole truth? Many thanks should be given to the author, as Shepherd has written a book about those who tend to get forgotten. While I write the weekly updates about the war and major battles, it is people in the cities and villages already ‘conquered’ who get forgotten about, who had to live under the cruel rule of their new leaders. Shepherd has told that story through the eyes of a child, who doesn’t take sides, as his innocence will be destroyed either way. The doesn’t dwell on detail and accurately gives the point of view of a child, a messy and confused state in a world which wouldn’t make sense to anyone. Albi is available April 19.